Put a medium sized pan of salted water on to boil, add a splash of vinegar. Put a griddle pan on to heat, when the pan starts to smoke, start grilling the asparagus. You may need to cook this in two or three batches depending on the size of your griddle. It will only take a couple of minutes for the asparagus to be cooked. Once all of the asparagus is cooked, season and set aside in the warm oven. By now the water should be boiling. Crack the eggs one at a time carefully into the water. They will take a couple of minutes to cook. Start toasting the slices of sourdough. Remove the eggs from the water. 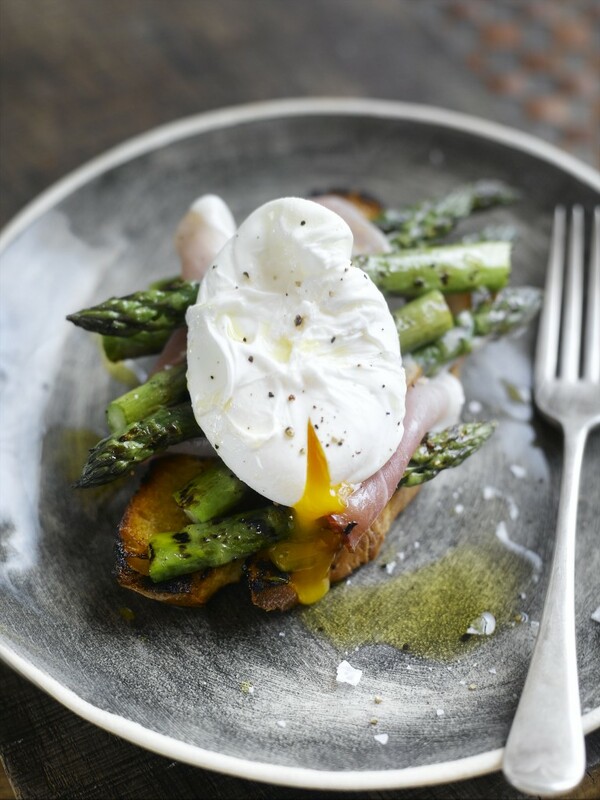 Divide the toasted sourdough between 4 warm plates, then top with the ham, asparagus and a poached egg. Finish with cracked pepper and extra virgin olive oil.